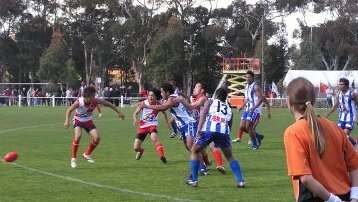 In the first major surprise of the AFL International Cup, the Samurai from Japan defeated the might of Samoa. Truthfully it was always a possibility that Japan could upset the AFL's seeding in this match, but to do so relatively comfortably, by 4 goals, was somewhat unexpected. It must rank as their best international win, and they certainly celebrated like it was. Unfortunately for Samoa the loss is likely to condemn them to positions 9 to 12 come the end of the competition, unless they can pull off the biggest upset in International Cup history and roll the Kiwis in their next match, in Warrnambool. Japan will be looking to mix it with some of the top sides, assuming they get the business done against India, a match which should be far less physical than today's. While the US team may have had many of its squad from game one on the sidelines for this match, its goalkicking star of game one, Kidney Lakomy started off where he left off the last, with a goal. There was a light northerly breeze and although this was only Round 2, Melbourne’s great finals weather had arrived at least a week early. China had the breeze in their favour but it was Rob Lutostanski for the US who soon added a second goal after marking. The Chinese put to bed any thoughts of an easy hitout for the Americans with a series of heavy tackles particularly from Li Cheng and making the Revolution earn their possessions. Ruckman Gao Rundong was winning taps in the center but the US still managed to clear. With an extended period of the ball bouncing from one half back line to the other, the US could only score points. It looked like the US would finally goal when Lutostanski received a free kick for high contact after a series of Chinese tackles. His kick however went wide. The Chinese team may have made more progress but many of their kicks contained more height than length. The US led by 14 points at quarter time and coach Rob Oliver wanted the forward line opened up as their forward 50 was continually full of players from both sides. The intention is to update these scores each quarter as the games progress. Match reports and images will follow later. All times are Australian Eastern Standard Time (AEST), which is +10 GMT. A warm day for Melbourne in August (late winter), 18 degrees Celsius and fine, getting quite warm for football with no clouds in the sky. Team Africa and Team Asia are multicultural teams based on ethnic groups within Melbourne, and their matches are part of the Multicultural Challenge, an adjunct to IC08 but not part of the main draw. Round 2 concludes when South Africa play Denmark at 12pm tomorrow (Saturday 30th August) at St Mary's in Geelong, just outside Melbourne. 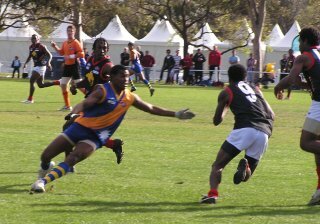 Round 1 of the 2008 Australian Football International Cup threw up some very one-sided results, all of which were expected, although some of the margins were runaway results. Round 2 should see a few more exciting and tight matches, as well as more blow outs. This author is 8 from 8 so far but could well come unstuck tomorrow. For what it's worth, here come the tips. Round 1 of the IC08 saved the best until last, as one of the tournament favourites, and dual runners-up, Papua New Guinea fronted Nauru, returning to Cup competition after missing in 2005. And what a contest it was. PNG are expected to be very good once again, and slightly favoured by this writer to go all the way, just. The way the tournament is structured, if a team loses one match and their opponent wins their other two rounds, there's no way the loser can make it through to the top four (an artefact of having to squeeze so many games into a short space of time in what is, after-all, an amateur competition). So the prediction was looking very shaky and the PNG brains trust must have been concerned when at quarter time the Nauru Chiefs led the Mozzies by 3 points, albeit after having had the use of a strengthening breeze. Playing in the middle time slot for Round 1, Samoa took on India in what was the first official game for the team from the subcontinent. The Samoans, newly dubbed the Kangaroos, smashed the Tigers as expected. But there was still plenty of interest, to see whether the Samoans had improved since solid 2002 and 2005 campaigns, and whether the Indians would cope with the big islanders. As it turned out, the Indians were brave and showed glimpses of talent, but the pressure of decent opposition never gave them much of a chance. 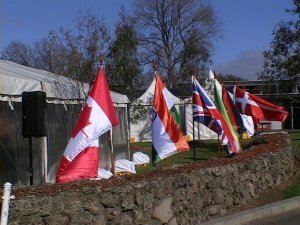 With the IC08 off and racing, media coverage is starting to trickle through. Read on for the links we've found so far to stories about the cup in the wider media, mostly from Australia, but also a few stories via NZ and India. Anyone knows of any more, leave us a comment and we'll update the list. Amongst a media scrum never before seen at the International Cup, it seemed everyone had come to see the Peace Team play but it was Great Britain who impressed on the field, giving a hint that they may have stepped up a level since 2005. The new men on the block were reasonably impressive early, with an attack on the ball that made life difficult for the Brits. 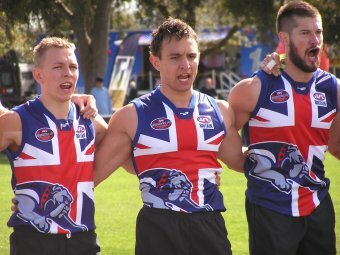 As with several other new footy nations, this competitiveness could not be sustained, and slowly the Bulldogs drew away. 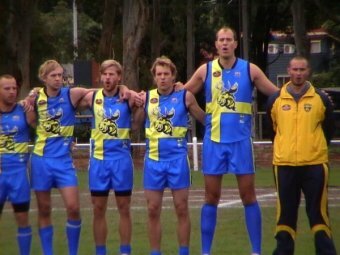 This article contains a selection of images from around Royal Park during Round 1 of the 2008 Australian Football International Cup, from umpires to flags, AFL staff and hotdog stands. Amongst the notable attendees were international footy visionaries Brian Dixon, who played a big role in South Africa and is now doing the same in India and China, and Ron Barassi, a long time advocate for internationalising the game and one of the originals to tour Ireland in the 1960s. Reigning International Cup champions New Zealand got the business done against one of the mid-ranked sides in Japan. The final margin of 92 points was an excellent result for the talented Falcons, although the general feeling amongst onlookers was that they didn't move the ball as well as expected given they are widely seen as the favourites in a competition that is improving amongst the top countries. The Samurai have found a few taller players since 2005 which should help their cause against other sides of similar ability. They were generally more athletic than last time, but were up against a strong outfit in a tough first hitout. Some of the stars from the last Cup were again prominent, such as captain Andrew Congalton and last Cup's grand final leading goal-scorer James Bowden, sporting something along the lines of a rats-tail, following up a distinct bleached blond look in '05. IC08 kicked off with former champions Ireland up against Sweden in their Cup debut. With the other two matches scheduled for the 11am time slot delayed slightly (presumably staggered start times to allow for the playing of national anthems etc), these two teams had the opportunity to score the first goal of the 2008 Cup - and perhaps surprisingly it was Sweden. Alas from that point on the Warrior defence proved impenetrable. That first goal was kicked by the Gothenburg Beserkers' Janne Nilsson, who weaved through traffic and stabbed the ball low and hard into a light breeze (which picked up during the day). Much of the first quarter was an arm-wrestle with neither side getting clear passages and questions were being asked - is this a sign of an Irish slide down the ladder of international footy that some have predicted, or are the Swedish Elks a top contender themselves?